Retired Commander of Zimbabwe Defense Forces (ZDF) General Constatino Chiwenga is congratulated by Chief Justice Luke Malaba after taking an oath of office as vice president at State House in Harare, Dec. 28, 2017. An army general who led the operation that forced Zimbabwean President Robert Mugabe to resign last month is now one of the country’s two vice presidents. Critics are calling President Emmerson Mnangagwa’s Cabinet a “coupnet” because of the three army generals who have prominent roles. A day after President Mnangagwa appointed them as Zimbabwe’s vice presidents, retired general Constantino Chiwenga and Defense Minister Kembo Mohadi took their oaths of office Thursday before the country’s chief justice, Luke Malaba. 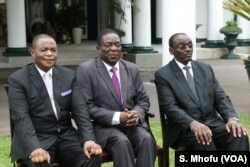 President Emmerson Mnangagwa (center) flanked by his just sworn in vice presidents at the State House, Harare, Zimbabwe, Dec. 28, 2017. After that, General Chiwenga, who led the operation that forced President Robert Mugabe to resign, spoke to reporters about his new position. Chiwenga becomes the third general in Mnangagwa’s 24-member Cabinet, raising fears that the army will try to influence Zimbabwe’s politics when elections are held in the middle of next year. 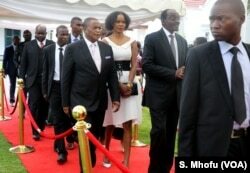 Retired general Constantino Chiwenga and Defense Minister Kembo Mohadi arrive at the State House to take oaths of office as Zimbabwe's vice presidents, Harare, Zimbabwe, Dec. 28, 2017. In an interview after the swearing in of Chiwenga, who retired from the army last week, Arnold Tsunga, who leads the International Commission of Jurists in Africa, said Mnangagwa’s government must try to assure citizens that the country is not under military rule. “So that a government that arises out of the electoral process, it can be said it is a government that reflects the sovereign will of the people of Zimbabwe, exercised through a free and fair election,” he said. Arnold Tsunga says President Emmerson Mnangagwa’s government must try to assure citizens that Zimbabwe is not under military rule as the country prepares for 2018 elections. Tsunga said there is no legal impediment to former generals serving in the cabinet, provided they give up their military positions. 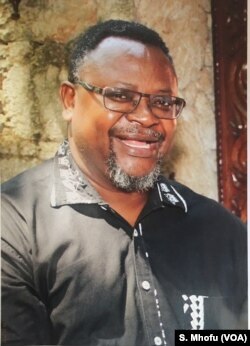 "However, what is noticeable and very curious is that: the military leaders who proclaimed the removal of President Mugabe have now not only directly contributed to his removal from power, but in fact gone ahead to be the direct beneficiaries [of] appointment to leadership position in government. Certainly it raises issues of credibility and trust,” he said. In addition to Chiwenga, former generals with positions in Zimbabwe's cabinet are Minister of Agriculture Parrence Shiri and Minister of Foreign Affairs Sibusiso Moyo. It was Moyo who announced on state TV in November that the army had taken over state institutions, the act that forced Mugabe to resign.